Updated Monday November 19, 2018 by Plainfield Junior Cats. As we bring the 2018 season to an end, I would like to say it has been an honor serving as your President. After being part of the greatest youth football and cheer league in the world it is a bitter sweet event to move on to other ventures. PJC is truly a family. It starts with our team players learning to rely on each other because football and cheer is not a sport of individuals or playmakers. There is a special bond that happens when players become accountable for each other, constantly challenging each other on and off the field. There are memories made that will last forever. Then the PJC coaches. Successful coaches are consistently making football about the kids and making it fun. Then focusing on their overall development by teaching the game, being a mentor, a teacher, even to some a father or mother figure. Coaches accept the responsibility that under their coaching, they are responsible for helping them to develop not only as athletes, but as people. There is such an investment by everyone that is involved in making an environment that the players can thrive in. To all of you I say thank you! There are several board members that will also be departing from the board. Ron Frydrychowski Treasurer, Frank Bruno VP of Equipment, Sarah Ibarra VP of Cheer, and Kathy Spiller Dir. of Concessions. You four are just awesome! I have never served with such a selfless, committed, loving board. What a pleasure it has been. Thank you to these people for their thousands of volunteer hours that they have invested and the sacrifice their families have made to our organization. They have left us a great foundation to build on. I wish to also thank the many volunteers that have participated in coaching, commissioning, directing, cleaning, serving, registering and so much more. 2018 brought a very exciting change. The BGYFL. It has been by far one of the best things that has happened to PJC. By participating the BGYFL it has made us a more competitive and superior organization. There will be even more teams added to the BGYFL that will help enhance our league as well. In conclusion, let me encourage you to volunteer. Get involved. It will be a decision you will not regret. There is not a feeling like having an impact on a child and the community. Coaches I hope to see you at our coaches meeting soon. And I look forward to seeing some of you at our December Board meeting. 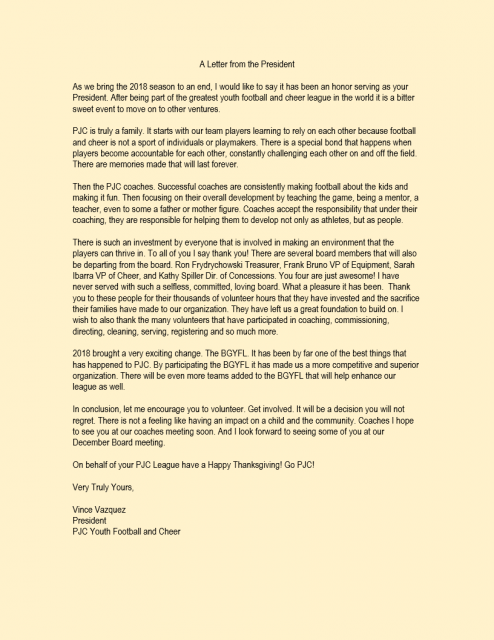 On behalf of your PJC League have a Happy Thanksgiving! Go PJC!